In actions reminiscent of the Cultural revolution, authorities across China are employing increasingly extreme measures to implement the directives of the Chinese Communist Party (CCP)’s Central Committee. In the 1960s, various types of absurd and bizarre behaviors were promoted to support the personality cult of Mao Zedong, while today’s state policy is promoting a cult of China itself. Bitter Winter has received multiple reports documenting such China-focused proselytization from the northeastern province of Liaoning. 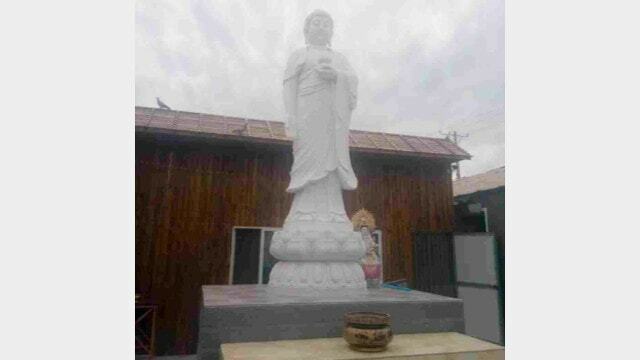 White marble Buddhist statue in a temple in Shenyang city, prior to removal. An incident in Shenyang city fits the pattern. The city’s Bureau of Religious Affairs organized a three-day conference in November 2018 for over 150 Buddhists at a temple to discuss “promoting traditional Chinese culture, being a moral Chinese citizen, harmonizing families, and having a happy life.” The key text for the conference was “The Standards for being a Good Pupil and Child” (Di Zi Gui in Chinese, the ancient manual based on the teachings of Chinese philosopher Confucius on how to be a good person). The conference also spent time studying the “spirit of the 19th National Congress of the Chinese Communist Party” and the speeches of Xi Jinping. Among the 150 participants were more than 20 Buddhist monks. The monks were required to wear red garments over their Buddhist robes emblazoned with the words “harmonious society.” All participants were forced to make profound triple-bows before an image of Confucius, twice during the conference. A Buddhist statue replaced with an image of Confucius. Such efforts to force Buddhists to discard their own teachings and adopt and reverence Confucian teachings in its place was only reinforced by the details of the image of Confucius. Why did a temple of Buddha have an image of Confucius in the first place? 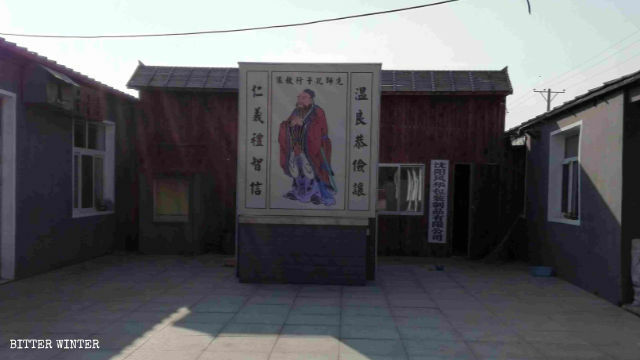 The space currently occupied by the image of Confucius originally belonged to a white-marble Buddhist statue, which the temple had bought for 60,000 RMB (about $8,800). In September of last year, however, the government ordered that the Buddhist statue be removed and replaced with an image of Confucius. Authorities now regularly inspect the temple, and the monks have to be careful to be studying only “traditional culture” when the inspectors arrive. They must wait until inspectors leave to continue studying Buddhist scripture. According to one local teacher, the Communist Party is exploiting Confucian theories to make the public bow to the government and keep them at the mercy of the government. Such replacement of religious beliefs with the ideologies of Chinese traditional culture is part of the “sinicization” of religion. The various techniques mandated by the CCP – such as holding examinations for preachers on traditional holidays, requiring that scriptures be explained according to Confucius thoughts, and requiring churches to teach “The Twenty-Four Filial Exemplars” (a classic text of Confucian moral values written by Guo Jujing during the Yuan dynasty, 1260–1368) – do more than change the external practices of religion; they lead to a real change in religious beliefs. Xile Buddhist Temple’s religious symbols, prior to purging. Also reminiscent of the Cultural Revolution are the destruction of religious images. 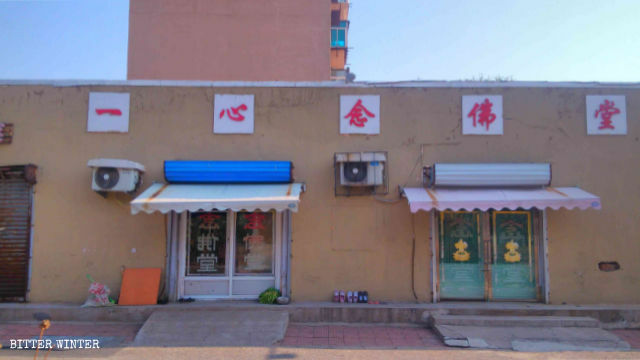 For example, the traditional images of lotuses and the traditional Buddhist couplet banners (two-line religious poetry) at the entrance of a Buddhist temple in the Tiexi district of Shenyang city have been painted over. The sign saying “Xile Buddhist Temple” has been removed from outside of its building, and three Buddhist statues have been removed and stored away in a shed in the temple’s rear courtyard. 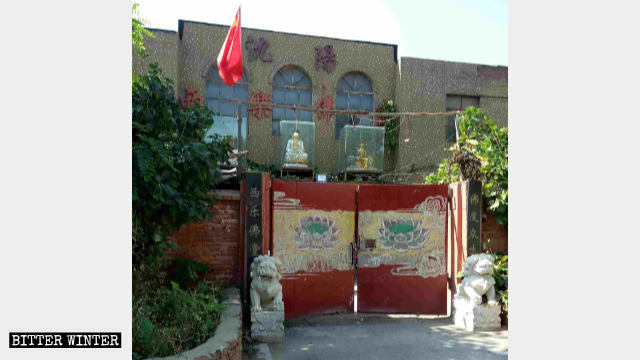 These actions were carried out at the end of October, after the temple received a notice from the local unit of China Buddhist Association demanding “elimination of religious symbols.” Now, one can barely tell that the building was once a Buddhist temple. Religious symbols have been removed from the Xile Buddhist Temple. 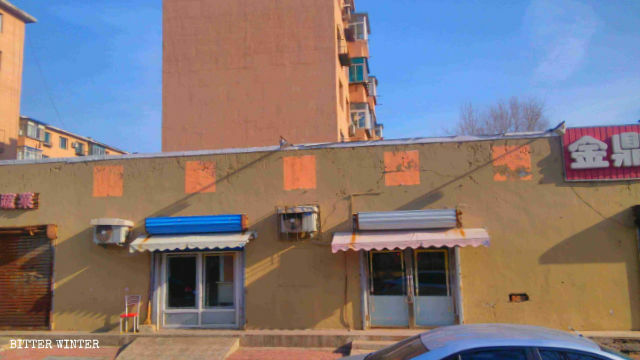 Another Buddhist temple in Shenyang city took down a sign board that read “Yixinnian Buddhist Temple” in an attempt to comply with the government regulations. On November 27, government officials further demanded that all items in the temple related to religious beliefs be removed. Sign board of Yixinnian Buddhist Temple in Shenyang city, before it was removed. 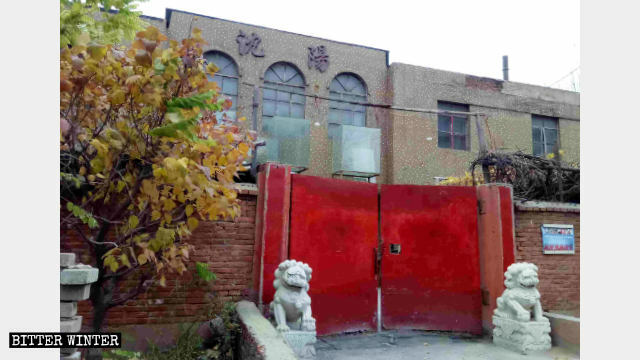 Signboards of Yixinnian Buddhist Temple have been removed. A third Buddhist temple was forced to remove its two-ton Buddha statue and bury it under ground. The head of the temple in Huludao city was threatened that the temple would be demolished if the statue was not removed. Even outside of the temples, Buddhists are being forced to abandon symbols of their faith. Commonly, middle-aged women in China dance in the public squares for exercise and fun. Dancers at a square in Haicheng city in Liaoning Province were threatened by police for playing the Buddhist “Great Compassion Mantra” in the square while dancing. One witness reports that police monitored the square for the next four days to ensure that the religious song was not played again. After not dancing for four days, the group replaced the Buddhist song with other songs in the hope that police would withdraw from the area. Daoist temples are also suffering from the “sinicization” campaign in ways reminiscent of the Cultural Revolution, when scriptures written in the Tang and Song dynasties, ancient woodcut scrolls of scriptures, and Tang-era statues all fell victim to senseless destruction. Thirty-four statues in a Daoist temple in Liaoning’s Donggang city were destroyed on the order of the authorities on October 26, 2018. Because the 34 statues were too heavy to move, authorities ordered the temple manager to destroy them. The manager, of course, refused. Instead, the Bureau of Religious Affairs hired local ruffians and, without notifying the temple manager, had them ambush the temple and destroy all of the statues. Government officials monitored the vandals to ensure that none of the statues were spared. One Daoist priest remarked, “It cost 4-5 million RMB (between $590,000 – 740,000) in funding to construct the temple, and the craftsmanship of the statues was first-rate. It’s really a shame that they were destroyed.” Now, however, the priest is worried about preserving the temple itself. 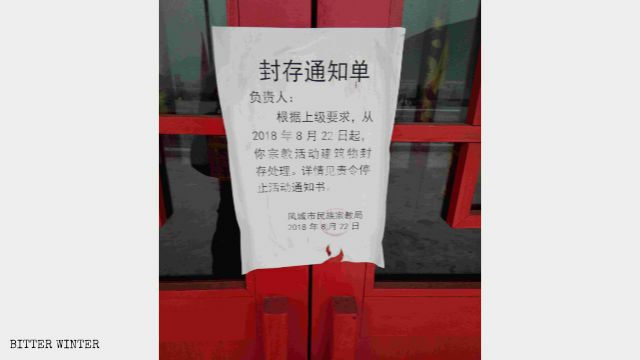 A notice of the closure of the Daoist Temple in Fengcheng. 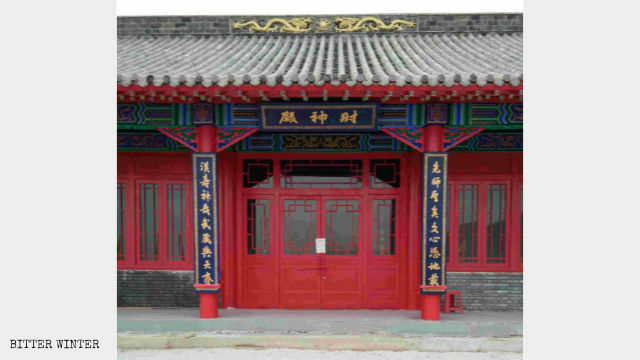 The Daoist Temple in Fengcheng was closed down. With their symbols and practices suppressed, and with “patriotic” slogans and teachings replacing religious teachings, believers must struggle to preserve the integrity of their doctrine and practice.